PET stands for “personal energy transportation.” A PET is a three-wheel, hand-cranked wheelchair to give mobility to those who have lost the use of their legs. The first PETs were produced in Columbia, Missouri a little over 10 years ago. Today they are also produced in Aurora, Missouri and many other sites. 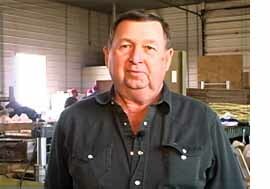 This video shows the process of producing and packing PETs at the Aurora PET production site. Note that when the PETs are packed for shipping every available space is used to add things that the recipients can use. A tool kit for repairs is a must. The plastic milk jugs are used for carrying and storing water. A toy for children is added along with a good number of clothing items. After an active appointive ministry, retired District Superintendent, Rev. 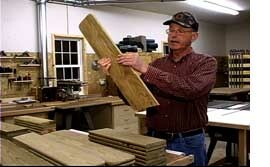 Robert McCombs, now has more time for carpentry. Bob, who has enjoyed woodworking all of his life, is devoting some of his time in retirement to making PETs. 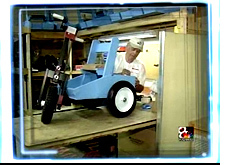 This episode of MissionCast shows Bob in his workshop with the PET pieces that he has produced. Mel West ,the founder of the PET program, is also featured in this episode. PET stands for personal energy transportation. A PET is a three wheel, hand-cranked vehicle for those who have lost the use of their legs. 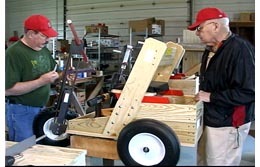 PETs are built entirely by volunteers like Bob. The cost of building and shipping a PET is $250. PET stands for personal energy transportation. A PET is a three-wheel hand cranked wheel chair for those who have lost the use of their legs. Every congregation in the Missouri Conference has been mailed a small model of what a pet looks like. With it comes the challenge for every congregation to grow the small model PET into the Gift of Mobility for someone who does not now have it. All it takes to do this is $250 which is what it costs to build and ship a PET. The offering for PETs will be received at the Annual Conference banquet in Springfield, Friday night, June 6th. For this MissionCast Mel West the founder of the PET program is interviewed. Mel tells about how PET came to be and what a difference it makes in the life of a person who is immobile. PET-Columbia celebrated the dedication of their new (new to them) building in grand style.Â PET stands for Personal Energy Transportation.Â A PET is a 3 wheel, hand cranked wheelchair for those who have lost the use of their legs.Â The PET production started in the garage of Mel West over ten years go.Â Â NowÂ PET-Columbia occupies its third home in a much expanded facility.Â Three faith groups participated in the dedication:Â Muslim, Jewish and Christian.Â PETs built entirely with volunteer labor cost $250 each for the manufacturing and transportation to far off lands.Â One of the major offerings at the 2008 Missouri Annual Conference will be for PETs.Â Plan now how your church might raise the $250 for a PET and give the “Gift of Mobility” so someoneÂ who does not have it.Â Plan a special fund raising event or take up a special Thanksgiving, Christmas or Lenten offering and give this wonderful “Gift of Mobility.”Â For more information about PETs go to:Â http://www.giftofmobility.orgÂ Also look in the MissionCast Archives for MissionCast Episode 3 about a PET delivery in Vietnam and MissionCast Episode 9 about the PET production in Mexico.Â The content of this MissionCast was provided to us by KOMU-TV in Columbia.Â The reporter was Jason Lamb.Â Â Â To view MissionCast click on the pictureÂ above or click on one of the links below.